For my friend's bachelorette party last weekend, we were cooking and cocktail shaking up a storm in a gorgeous and sprawling ranch in Ojai. The first night, after fighting through hours of Memorial Day traffic, we all needed something light and refreshing. Martha Stewart's recipe for a Lillet Rosé Spring Cocktail was a perfect way to celebrate the bride-to-be — it was pink and girly, smacked of spring and matched our flower and palm-tree filled environs. Next time I make this, I'll use fresh-squeezed grapefruit juice, but sometimes I allow myself to be a little lazy...We didn't have edible flowers on hand to garnish these drinks, but I'd recommend topping with some fresh raspberries or strawberries that mirror the flavor profiles in the Lillet Rosé. I'm looking forward to whipping this up again for a girly brunch or Mother's Day celebration. - In a cocktail shaker filled with ice, add all the ingredients. - Shake until well chilled and strain into a chilled coupe or wine glass. - Garnish with flowers or berries. This past weekend, I was in Ojai with my girl friends for a most memorable bachelorette celebration. We stayed at this beautiful "compound," which had a couple of hot tubs, a gorgeous pool, two outdoor tiki bars and multiple indoor and outdoor kitchens. It was like a tropical paradise mixed with a SoCal cabin in the woods. Because of the amazing cooking and dining set-up, we prepared a few epic meals for the sixteen ladies gathered. I cooked the last night with a few friends, and because the bride is vegetarian and we had been eating and drinking so much the entire weekend, we opted for a bunch of healthy veggie dishes and salads. I had been wanting to make this recipe by the talented M.B. Post and Fishing with Dynamite's David LeFevre for a while, plus cauliflower appears to be the "it" vegetable right now. We made a few alterations to the recipe — I couldn't find sultanas in Ojai, so used golden raisins, we skipped the pine nut and caper berries garnish (because frankly, I forgot) and my friend suggested adding some cumin to it. We used a Sauvignon Blanc for the wine sauce, since we had been drinking that all week in the hot Ojai sun. This dish ended up being one of the favorites of the night and the girls were racing back for seconds and thirds. I had tripled the recipe, and it still wasn't enough! I know I'll be making this again sooner, than later. - In a small bowl, combine the raisins and white wine and set aside. - Preheat oven to 400. - Place the cauliflower on a roasting pan or baking sheet and drizzle generously with olive oil. - Sprinkle with the cumin, salt and pepper. - Roast for 20-25 minutes, until tender and slightly browned. - In a small pot over medium heat, add the 4 Tbs of olive oil. - Add the shallots and garlic and sweat them for a couple of minutes. - Add the raisins, white wine and capers to the pot. - Cook the sauce until it's reduced by half. - Cool the sauce to room temperature, and salt to taste. - When the cauliflower is done, spoon the wine sauce over it and stir in the herbs. - Garnish with some caper berries and pine nuts. 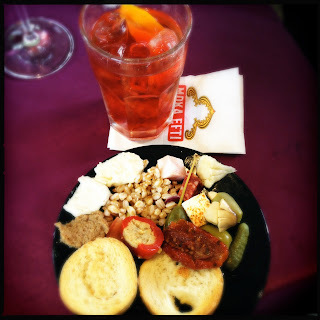 Last week, I was recounting my vacation to Italy and fond memories of Aperitivo time. Before I even left for the trip, I bought a bottle of Aperol (yet another bottle to add to my amari collection) because I anticipated I would be craving Aperol Spritzs upon my return. Aperol Spritz is probably one of the most popular cocktails served during aperitivo. It's slightly bitter and slightly sweet and oh so refreshing. I still have no idea why it's served in a wine glass, but just roll with it. My family and I had one of these nearly every day. Making this drink at home helps me relive the memories of that trip, and now that summer is nearing, it's the perfect cocktail for those summer afternoons and early evenings. - In a wine glass filled with ice, fill about 2/3rds way with prosecco. - Add about an ounce of Aperol. - Top with about an ounce of club soda, or to taste. - Garnish with an orange slice. About a month ago, one of my best friends had us over for dinner and served us some delicious baked salmon with raita, an Indian yogurt sauce. I wanted to replicate the recipe, but of course needed to find a way to incorporate some booze. This Poached Salmon with Cucumber Raita from Food & Wine involves a white wine broth with plenty of herbs to quickly cook the fish. The ingredients are simple and healthy, and the recipe takes no time at all — perfect for those harried weeknights. The amount of raita this recipe makes is slightly ridiculous, but it's good enough to eat out of the bowl (yeah, that happened before I had time to spoon it on the fish) and is perfect for spreading in pita sandwiches the next day. I served the fish with some arugula (thank you, Maggie's Farms!) on the side to mix in with the raita. - In a medium glass or stainless-steel bowl, add the cucumber with 1 tsp of the salt. - Let the cucumber sit for 10 minutes. - Using your hands, squeeze the grated cucumber and discard all the liquid. - Return the grated cucumber to the bowl and add the yogurt, garlic, mint and ground pepper. - Refrigerate until you're ready to serve. - In a large pan or Dutch oven, add the water, wine, vinegar, onion, carrot, parsley, thyme, peppercorns, bay leaves and 2 1/4 tsp of the salt. - Cover and bring to a boil over high heat. - Reduce the heat and simmer, partially covered, for about 10 minutes. - Add the fish to the liquid and bring back to a simmer. - Let the fish simmer, partially covered, for about 4 minutes, or until the fish is barely done. It should still be translucent in the center. - Remove the pan or Dutch oven from the heat and let the fish remain in the liquid for about 2 minutes. - Transfer to plates and serve warm or at room temperature. - Spoon the raita onto the fish and sprinkle some paprika on top. The Lush Chef and her family recently returned from a 10 day trip through Italy, where we literally walked, ate, walked, drank, walked some more and ate and drank to our heart's desire through Florence, the Tuscan and Umbrian countrysides and finally ending in Rome. Surprisingly, one can actually lose weight in Italy with the Lush Chef family's walking and eating regimen. I highly recommend it. Hotel cappuccinos put pretty much every US coffee shop cappuccino to shame, the best mozzarella and mortadella was consumed in every osteria we picked, gelato was deemed the perfect substitute for an actual lunch, and porchetta was shaved off in thick slices with plenty of "crostini" (the crispy, salty skin) at street stalls and served with little more than a fresh baked roll and some salt. Huge slabs of meat were hacked off a cow in full-view by whom I've now deemed the meat cleaver-wielding "steak nazi,"and was proudly presented to us before he grilled it up at Osteria Acquacheta in Montepulciano. And we drank plenty of that earthy Vino Nobile in the same glass as our acqua frizzante because of the proprietor's one glass policy — the glare you'll receive if you ask for another glass is just not worth it. There was my brother's instant love of amaro (I'm such a proud sister) after sipping from my glass of Averna while perched at a table upon a hilly cobblestone street in Siena and tucking into our coffee crème brûlée. My brother fully became enamored with amaro after our nearly daily stops for aperitivo. It was our first day in Florence, dinner was late (per the Italian custom) and we were attempting to combat the tiredness from our overnight flight into Rome, the train ride into the city and the hours of walking to take in the sights. My mom is a huge chocolate fan and was stopped dead in her tracks by the confectionary display at Gilli, a bar, cafe, candy store and restaurant that has been in the Piazza della Reppublica since 1733. Being the lush that I am, my eyes wandered to the massive marble bar, and the impeccably dressed barista garnishing some Aperol Spritzs with orange slices. My dad and my brother's eyes settled on the massive buffet of olives, cheeses, meats and other appetizers laid out on the bar. Aperitivo is like happy hour in the US, but a hundred times better. Starting around 6:00pm until about 9:00 or 10:00pm, and for about 6-10 euro (8-12 dollars), folks gather at the bars for a pre-dinner drink or "aperitivo" and a free buffet. Some of the buffets were simple in nature — potato chips, taralli (pretzel-shaped spiced crackers), olives, pickled vegetables, cured meats and cheeses. While others got a little more extravagant and put out a wide range of tapenades, vegetable spreads and little stews and casseroles. Of course, if you're a true Italian or just want to fit in, don't go up to the bar a bunch of times and stuff your face. Italians don't drink to just drink like so many American college co-eds. If they're going to have any kind of alcohol, it's always going to be with food. So put on a "bella figura" and be classy. We quickly got addicted to this time of day. After hours of sight-seeing, we always needed a moment to just sit, rest our legs, have a snack and a stiff drink. My dad especially, since he braved Italian traffic with a stick shift on many of these days. He's a saint. And we prayed to many to help us navigate those endless traffic circles. My dad enjoyed relaxing over a nice and inexpensive glass of Italian red (you can't go wrong with the house wine), while my brother, mom and I often opted for an Aperol Spritz, a traditional cocktail made with prosecco, Aperol (a bitter Italian liqueur), a little splash of soda water and an orange slice. Stay tuned for the recipe next week! When I needed something a little more fortifying, I opted for one of my favorite cocktails, the Negroni. This also became another favorite for my brother — he plans on stocking up his non-existent bar with Campari, Averna and Aperol now. Good kid. 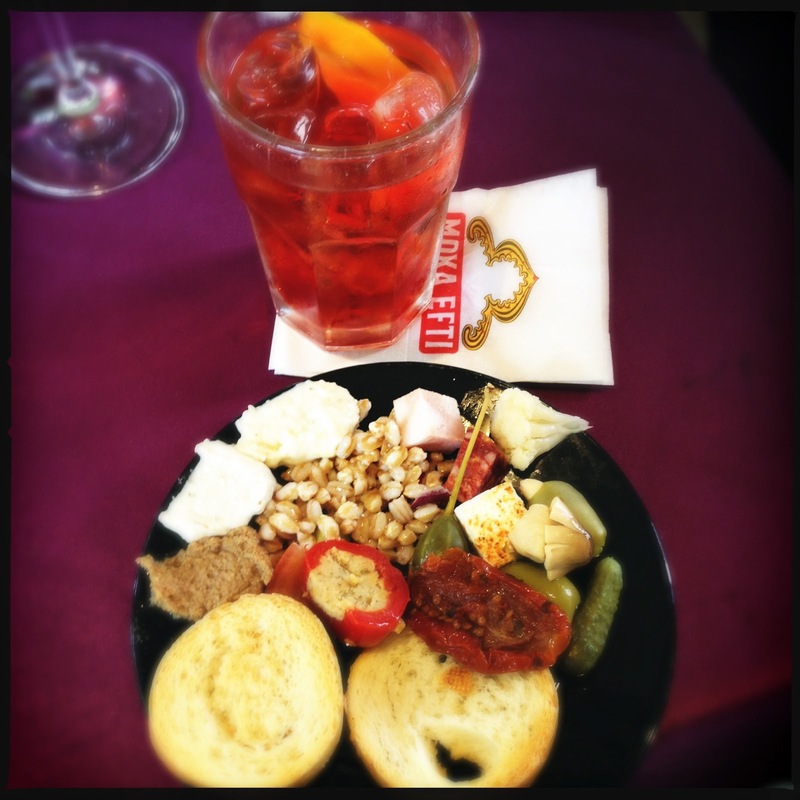 Now that I'm back in the states, I truly miss aperitivo time. Yes, we go to our requisite bars after work and have a delicious craft cocktail, but it's something about the spirit of aperitivo that bars back here just can't capture. It's that idea of collectively relaxing and conversing before going on to a long and leisurely late-night dinner with your friends and family. It's the concept of just slowing down and decompressing after a hard day at work. Here in LA, drinks have been turned into a function of our jobs. We're expected to schedule our entire month with breakfasts, lunches and drinks so we can network and wheel and deal our little hearts out. Maybe it's time we scheduled in more aperitivo time into our lives, and to just remind ourselves that there's nothing better than stopping the clock for an hour to enjoy a cocktail. Windy, cool spring days call for braising, especially when it's a lazy Sunday. This is one of my favorite ways to cook meats, because it makes everything so tender and it's pretty much a hands-off process —perfect for dinner parties. This Braised Chicken & Kale in White Wine from Sweet Sugar Bean is incredibly easy and flavorful, with the paprika giving it a nice, smokey punch. A friend of mine had brought back some smoked paprika for me from Hungary, so I had been looking for a recipe that would really highlight it. The chicken just completely falls off the bone and the kale tastes so yummy after it's been simmering in the braising liquid. Use a dry white wine like a chardonnay, pour yourself a glass after you pour some in the pot, and sit back while that Dutch oven does it's thing. - Generously sprinkle salt, pepper and paprika on both sides of the chicken, rubbing the spices in. - In a large Dutch oven or skillet, heat the 2 Tbs of olive oil over medium heat. - Place the chicken pieces in the Dutch oven skin side down and brown both sides. Don't crowd the chicken, so brown them in two batches. - Remove the chicken onto a large plate and set aside. - Add the onion and garlic to the Dutch oven, and sauté until softened and translucent. - Return the chicken to the Dutch oven and add the broth, wine and herbs and bring to a boil. - Cover and let it simmer for 40 minutes. - Remove the lid and add the maple syrup and cream. - Gently stir in the kale and let the sauce reduce for about 15 minutes. - Spoon some of the braising liquid over the chicken and kale when serving. I just got back from Italy with my family and can't wait to share details of the trip with my readers, along with new recipes and cocktail ideas. But before I left, I queued up a bunch of posts, as I had a feeling the last thing I'd want to do is cook and write while jet lagged. I made this Spring Vegetable Risotto with Pernod Shrimp from Food 52 for some neighbors a few days before I left for the "Eternal City." Even though I knew I'd be eating a lot of risotto and pasta, the peas and asparagus just looked so beautiful at the market that I couldn't resist. The large amount of veggies, and the addition of mint and lemon freshens up what's normally considered a heavy dish. The original recipe calls for preserved lemon rind, which I didn't have time to make, so using fresh lemon zest is just fine. Pernod, which is a French anise-flavored apéritif and absinthe, plays heavily in this dish — there's 1/2 cup stirred into the risotto and 2 Tbs marinated with the shrimp. Don't be scared off by the word absinthe though. You're not going to start seeing the green fairy with Pernod distributed in the U.S., as the levels of wormwood, which contributes to those hallucinations, is pretty low. The anise flavor in the Pernod and the fennel complement each other so well in this dish too. I don't have a grill, so I quickly cooked the shrimp in the broiler, for about a little over a minute on each side. - On a rimmed baking sheet, toss the shrimp with the olive oil, Pernod, garlic, lemon zest, rosemary, salt and pepper. - Let the shrimp marinate at room temperature while the risotto is prepared. - First, blanch the asparagus by bringing a kettle of water over the stove to a boil. - In a glass baking dish, line up the asparagus in a thin layer. - Pour the boiling water over the asparagus and let it sit for 3-5 minutes, or until the spears are crisp tender. - When the asparagus has cooled, chop into 2-inch lengths. - Meanwhile, heat up your chicken stock in a stockpot, as this is going to help your risotto cook properly and get the right, creamy texture. Cold liquid is bad for making risotto and room temperature is meh. Always use a hot liquid. - In a large Dutch oven, heat up the olive oil over low heat. - Add the onion, fennel and garlic and let them sweat for about 10 minutes, or until all the ingredients are soft and translucent. - Season with some salt about halfway through. - Add the Arborio rice and bring the heat up to medium-high. - Stir to coat the rice and slightly toast it for about 3 minutes. - Add the Pernod and lemon juice to the rice mixture and continue stirring until almost all the liquid is completely absorbed. - Add a ladleful of the hot chicken stock to the rice mixture and continue stirring. - Make sure the temperature of the rice is an even, medium heat with a few bubbles coming to the surface. It shouldn't be boiling, but you also don't want the heat too low. - As the stock gets absorbed, add another ladleful and stir away. Ladle and stir. - Keep going until the rice is creamy, but still al dente, for about 20-30 minutes. - Remove the risotto from the heat and immediately fold in the butter, mascarpone, lemon zest, peas, the majority of the mint (saving some for garnish) and some generous grinds of the white pepper. - The heat of the risotto will actually cook the peas. Yay! - Stir slowly to blend all the ingredients and check for seasoning - add more salt and pepper, if needed. - Carefully fold in the asparagus and put a lid on the risotto. - Grill or broil the shrimp for about 60 seconds on each side, or until the flesh is completely opaque. - Top each serving of risotto with 4 shrimp, some mint and a little pepper. As you're reading this, the Lush Chef is currently galavanting across Italy with her family and picking up all sorts of inspirations for tasty dishes and cocktails to share with all of you. In preparation for that trip, I did a lot of cooking and cocktail shaking, so all of you wouldn't go through any kind of Lush Chef withdrawal. This Italian Greyhound with Rosemary Sugar from the Family Style Food blog was the perfect libation to get me in the mood. Yes, I've been doing a lot of gin cocktails lately, so bear with me. I had a bunch of leftover grapefruit juice from making these Grapefruit Sparklers and used some of the fresh rosemary growing in my little herb pots outside. I went and bought a bottle of Aperol, an Italian amaro, as I had a feeling I'd be craving Aperol Spritzs upon my return. This cocktail is incredibly refreshing for the spring and summer, and it looks so pretty with the rosemary sugar. It's perfect to serve at brunches or at daytime parties. The combination reminds me of this Campari and Grapefruit Cocktail that I like to make, but a lot less bitter. Saluté! - On a small plate or ramekin, combine the chopped rosemary and sugar. - Run a wedge of grapefruit around the rim of a glass. - Dip the rim of the glass into the rosemary sugar. - In a shaker filled with ice, add the gin, grapefruit juice and a splash or two of Aperol. - Shake and pour into your prepared glass. - Garnish with a sprig of rosemary.